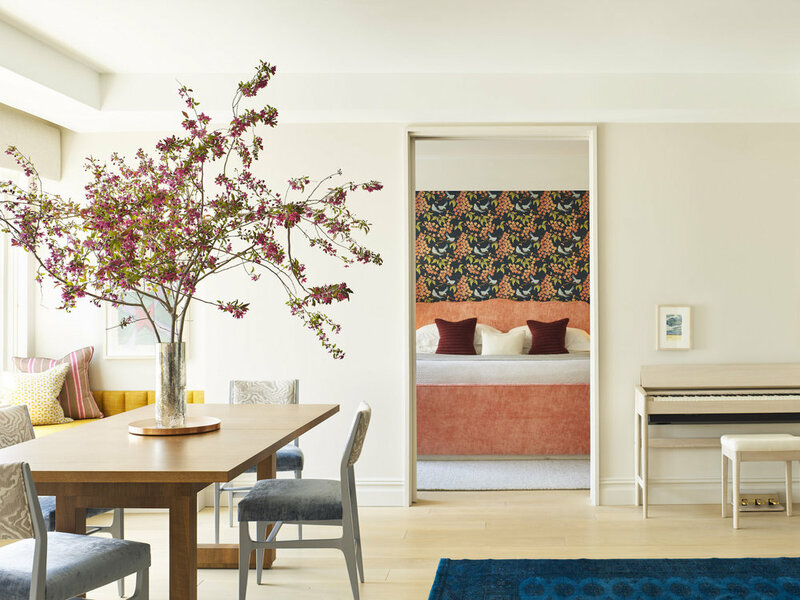 Interior and architectural designers Andrew Halliday and David Greer focused on chroma and pattern while thinking about their design for this bright and color bathed residential renovation in lower Manhattan. The entryway paneling is painted a deep teal blue and creates a wonderful arrival that opens up into the rest of the bright apartment. Bold patterned wallpapers were integrated with other graphic elements to create an environment that truly represented the owners themselves. Russell Maret, a type designer and family member, provided some of his typographic artwork, which adorn the walls with color and symmetry. Watermill photos by Joe Fletcher. Brooklyn-based architect Sarah Zames grew up in Northwest Connecticut and has been living and designing in New York City and Los Angeles for the past two decades. After working at several international firms, including Skidmore Owings and Merrill, Tod Williams and Billie Tsien Architects, and Rafael Viñoly Architects, her attraction to the intimacy and scale of residential design led her, in 2010, to start General Assembly - a team of designers and project managers who believe that the details of a home should come from the unique, personal details of the people who live there. In addition to ground up and full renovation projects, GA designs custom lighting and furniture. After the successful completion of the Watermill project, which features Hudson Company Bare, White Oak, Flat Sawn floors, we wanted to sit down with Sarah to discuss a bit about her team’s creative process and how they brought the Watermill project to life. First off, how did you distill the clients' needs / ideas into a clear vision for the design of this project? The house was designed for four different people (from two different generations) to enjoy. So, we naturally had some differing opinions on style. We wanted to make sure we were able to work the personality of everyone into the design, and took input from everyone involved. One unifying factor between everyone was their love of travel. They often traveled as a family together, and brought back some great art pieces. We made sure to find places to include those in the space. We tend to use natural materials in all of our projects because they are ageless and will not go out of style. For this project, using natural materials was a big part of bringing balance to the design. We combined natural materials with more modern details and, in doing so, we were able to achieve a comfortable elegance. How did the design of this home fit into or contrast the historic design vernacular of the Hamptons? The Hamptons is an interesting place because it has both a very formal and a more relaxed artistic history. This project was a balance of those two contrasting ideas. We wanted to maintain some of the formality, but also create a comfortable place to enjoy the weekend. We achieved this balance by creating more modern versions of some traditional details (for example, the paneling on the stairs and family room ceiling), and by bringing in natural materials that would age over time. It's clear that your team loves the custom details of design (from finishes, lighting, furniture, etc.). Can you talk about this high-level of creative detailing and how this style of work allows you to serve your clients and create unique design? We feel that the best part of doing a full renovation is being able to have everything designed exactly to your taste. Designing custom details, like the brass tops to the railing balustrade, is one of the best parts of what we do. It means that the homeowners get to enjoy something that is unique to them, and we get to experiment with design and work with really great craftspeople. Lastly, can you talk about your experience collaborating with The Hudson Company during the Watermill project? We started working with The Hudson Company very early on in the project. Flooring is one of the biggest decisions you make on a project and locking that decision in in the beginning is important in order to keep the other decisions on finishes in line. What I enjoyed about Hudson was the education they brought to the clients. They respect the fact that [wood flooring] is a big investment and they took the time to educate the clients on the importance of quality flooring. Go inside the Watermill residential project here and here. As we approach the dry winter months, we’d like to remind all our friends, clients, and partners of the importance of monitoring the interior environmental conditions in your home, office, and retail spaces—specifically the temperature and relative humidity levels. Natural expansion and contraction of wood can be caused by insufficient or excessive relative humidity. So, to reduce the chance of damage to your wood floors, the National Wood Flooring Association recommends a climatic temperature of 60 - 75 degrees Fahrenheit and 35 - 50% relative humidity. Enjoy your wood floors for decades to come! *For more information, please visit www.nwfa.org or contact The Hudson Company directly. *For more tips on maintaining and protecting your wood floors, stay tuned to this blog and follow The Hudson Company on Instagram at @thehudsoncompany. *Plan on scheduling a visit to our NEW SHOWROOM in Ridgefield, CT, opening on 11/14/2018. More info on that to come! ‘Rippings,’ scraps created during the process of milling Reclaimed White Pine planks at The Hudson Company Mill in Pine Plains, NY. ‘Before’ detail of raw material. After being milled by The Hudson Co. The photos above and below illustrate just one example of how The Hudson Company works to redirect historic building materials away from the waste stream and then uses our team of skilled craftspeople to re-mill this valuable material so that it can be put to new uses in a wide variety of applications. The planks shown here are antique pine boards salvaged from a historic farmhouse in the Finger Lakes district of NY in 2018. After being transported to The Hudson Company Mill in Pine Plains, NY, the planks were then sorted, graded, and de-nailed by hand before being re-milled. And while it may have been hard to see the beauty in these old pine planks when they first arrived in Pine Plains, our team of pros has decades of experience in transforming gray, weather-beaten, and antique planks into stunning new floors. See for yourself in the photos above and below. Explore our full range of quality flooring products. Learn more about The Hudson Company’s FSC-certified Mill in Pine Plains, NY. Learn more about our sustainable wood reclamation process. The Hudson Company team hard at work de-nailing planks by hand.